BlackBerry 9000 Hardware Specs - Now What to Call It?! Building upon yesterday's OS4.6 feature enhancements news, the BG followed up today with confirmed final hardware specs on the BlackBerry 9000. Nothing too new to report here that hasn't been rumored before, but figured it's worthy of a post as I wanted to Pose a Question to the CrackBerry Community. It seems whether this new device gets released as strictly the 9000 or will be given a consumer market name like the CURVE or PEARL has to be determined. 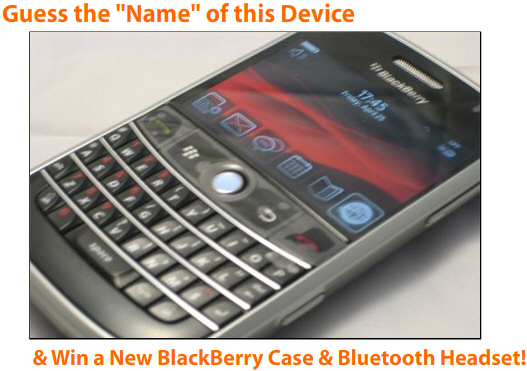 What I want to know is, what you would name the new BlackBerry 9000?! I was thinking I'd give it a name like Earl or Duke or Betsy or Daisy...that would be sweet. Check out my BlackBerry...she's a Daisy. What's that gadget? It's the Duke of Smartphones. Maybe not. Leave your ideas in the comments... they HAVE to be better than mine. Heck, let's turn it into a contest. Be the first person to leave a comment on this post with the name that the BlackBerry 9000 is ultimately released under (assuming it gets a REAL name and not just numbers) and we'll hook you up with a new case and standard bluetooth headset of your choice courtesy of ShopCrackBerry.com! Make sure that you're logged in or your entry won't count. Contest open until RIM actually makes their official Press Release. In the event the device gets released under the 9000 brand (no catchy word to go with it), we'll give the prizes out to the most creative answer. I love how "high quality materials and high-end finish" is a feature. I think that's the tell-tale sign that the info above is legit. Don't forget to post your NAME suggestions in the comments!!! !